This mini-application is used by the press operator to enter production information directly into the Presstimator. The Actuals App software is loaded on to a computer on the pressroom floor, without needing to install the Presstimator on that computer. 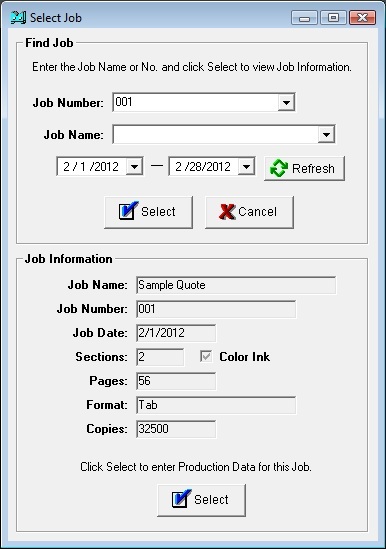 The pressman simply selects a Job from the dropdown (either by Job Name or Number) to enable data entry. Once the Job is selected, information about the Job is loaded and the pressman can enter the start and end times (or the pressman simply clicks on each 'Now' button as the job progresses to enter the current date/time stamp for the make-ready and run times). The pressman can also enter the press counters for the startup and running copies. 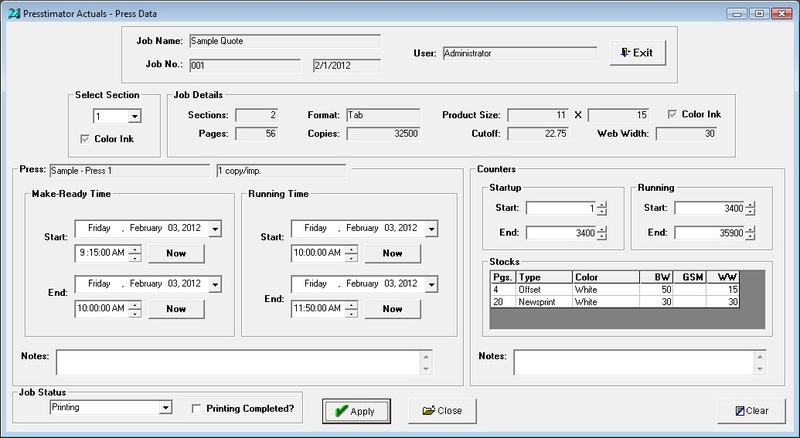 Once the pressman is done, clicking on the Apply button submits the information directly to the Presstimator database. The production data entered on the pressroom floor using the Actuals App is immediately available to the estimator. By streamlining the data collection process, the Actuals App saves time and minimizes error. The estimator no longer has to manually enter this information into the Presstimator in order to generate the Profit Analysis and Estimate vs. Analysis reports.